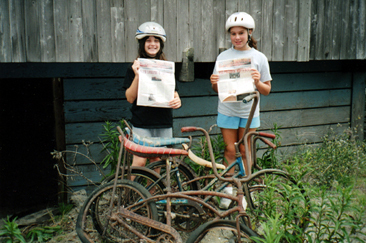 Typical Excentric Readers from New Jersey are Megan Keenan and her friend Zoe shown here with the banana-seat bikes they unearthed behind an old barn while reading a copy of their favorite paper, The Sedona Excentric. They chose the location based on the fact that other kids and some adults were calling them “braniac” and “wonder girl” each time they read a new edition. The Excentric World Staff collectively salutes the girls and advises them to shine up those old bikes, then sell them on eBay.